A top satellite image provider released photos on Sunday of a Syrian military base that Israel allegedly leveled on Friday night. 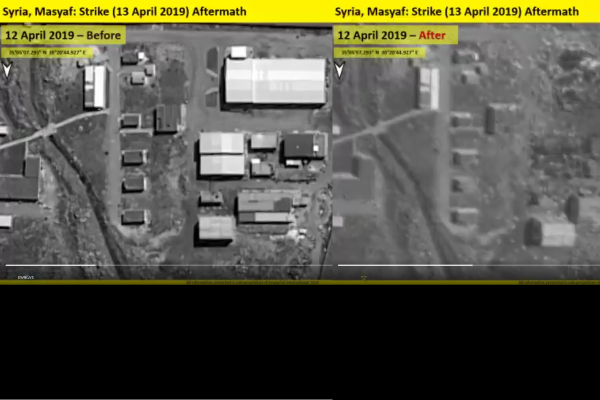 ImageSat International (ISI) released a series of images on Sunday showing extensive damage to a Syrian military base that Syria’s official state news agency SANA attributed to an Israeli airstrike on Friday evening. ISI’s photos show several destroyed structures, including a hangar and a number of other buildings, near Masyaf in the Hama province. This area has been identified in the past as a breeding ground for Iranian troops and the Lebanon-based terror proxy, Hezbollah. Following the strike, the buildings were identified as missile production facilities. In response to the airstrike, the U.K.-based Syrian Observatory for Human Rights issued a report announcing that a number of Iranian fighters and pro-Iranian troops were killed in the attack. In addition, 17 people were also reported injured. Since Syria was thrown into disarray eight years ago by a bloody civil war, which coincided with the rise of the Islamic terror group ISIS, Iran has attempted to establish a military stronghold on Israel’s doorstep. The Jewish state has identified Iranian entrenchment in Syria as a red line it will not tolerate, and has backed up the position with hundreds of strikes in Syrian territory over the past two years, many of which have targeted Iranian forces. As of Sunday evening, Israel had not confirmed its role in the Friday night strike, consistent with official Israeli policy on such incidents.